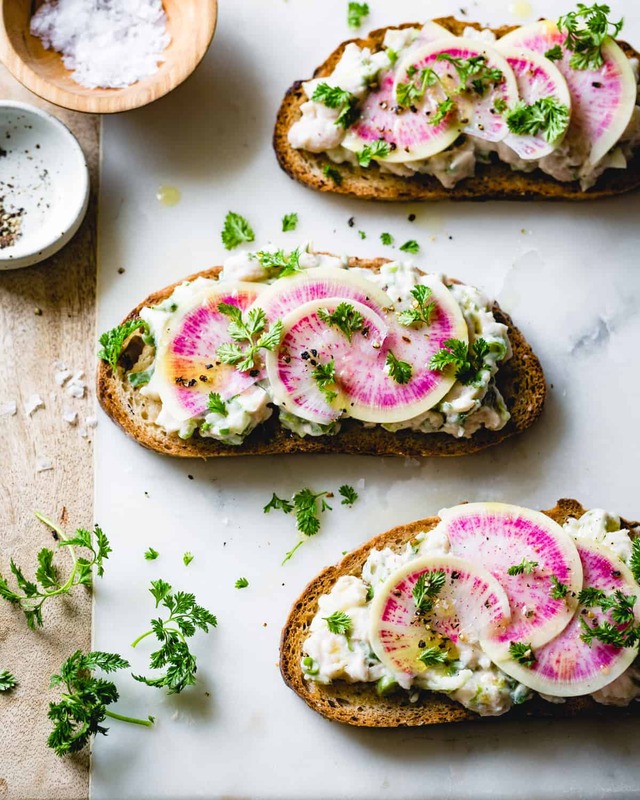 Creamy white bean salad flavored with herbs and crunchy vegetables makes a quick, easy lunch on toast. Vegan and gluten-free options. Adapted from Pretty Simple Cooking. Sometimes the tastiest foods are the most simple. 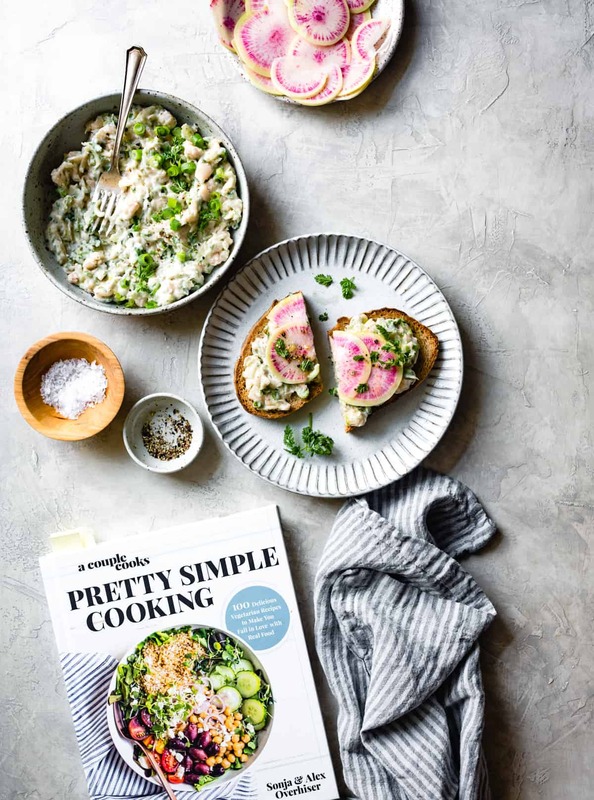 That’s the premise behind Pretty Simple Cooking: 100 Delicious Vegetarian Recipes to Make You Fall in Love with Real Food, by Sonja and Alex Overhiser of A Couple Cooks. 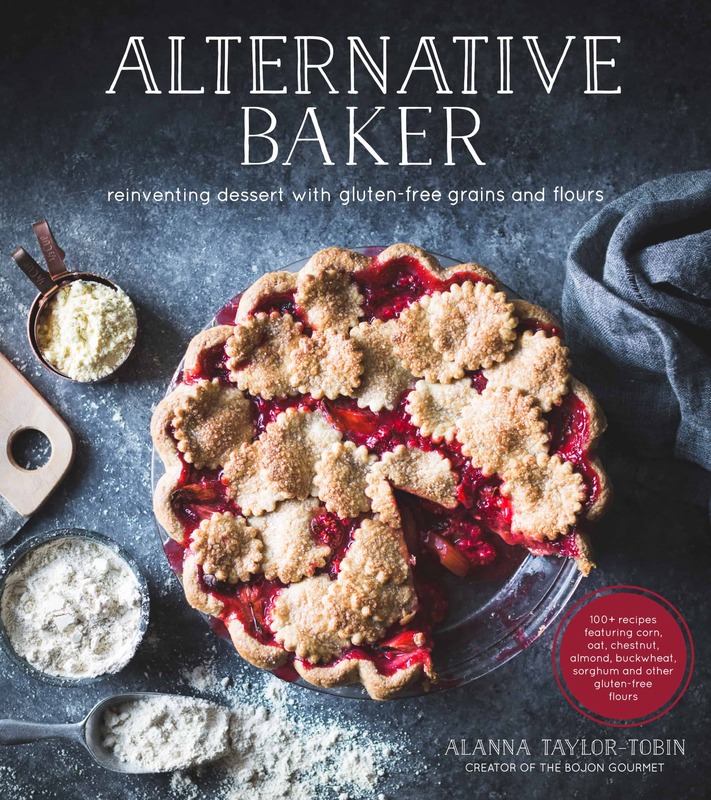 I’m loving this book because though I’m great at making such slow, impractical things as croissants from scratch, homemade ice cream with magic shell, elaborate tarts, pies, and galettes, hand-rolled blintzes and sushi burritos, etc., I often draw a blank when it comes to quick, easy meals. No more! 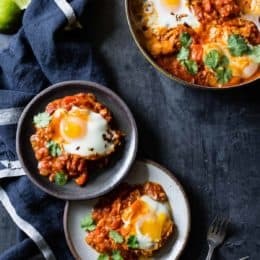 Sonja and Alex have compiled a collection of beautifully photographed vegetarian recipes that are short on prep and long on flavor. 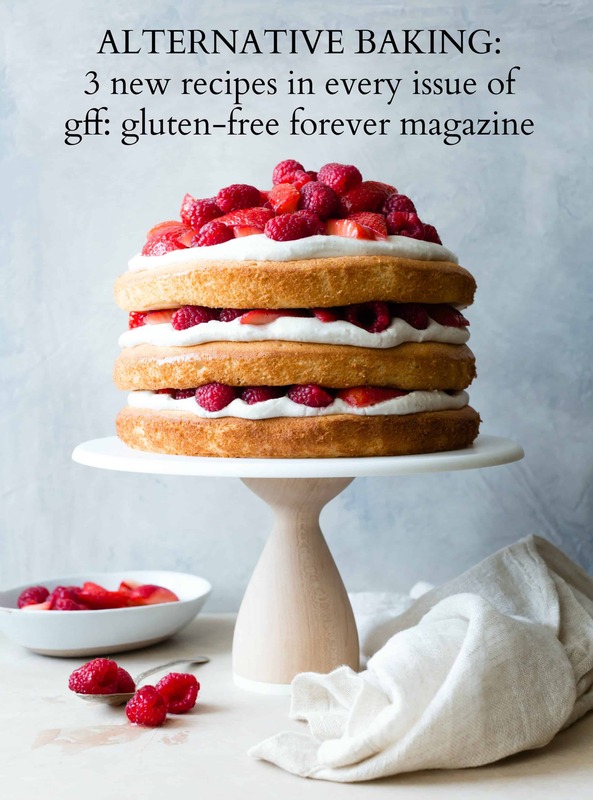 Most recipes come with vegan and/or gluten-free suggestions if they’re not that way naturally. Scattered throughout the book are heartwarming life lessons and quotes illustrated with sweet watercolor sketches by the talented and lovely Ashley Rodriguez of Not Without Salt. 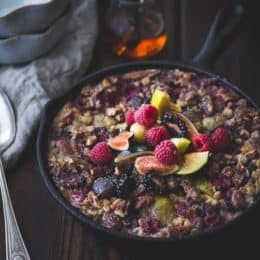 One of my favorites is “Slow Down” which encourages the reader to take time in the kitchen and cook as a relaxing outlet. This sums up my whole philosophy on cooking and why I named my blog The Bojon Gourmet in the first place. 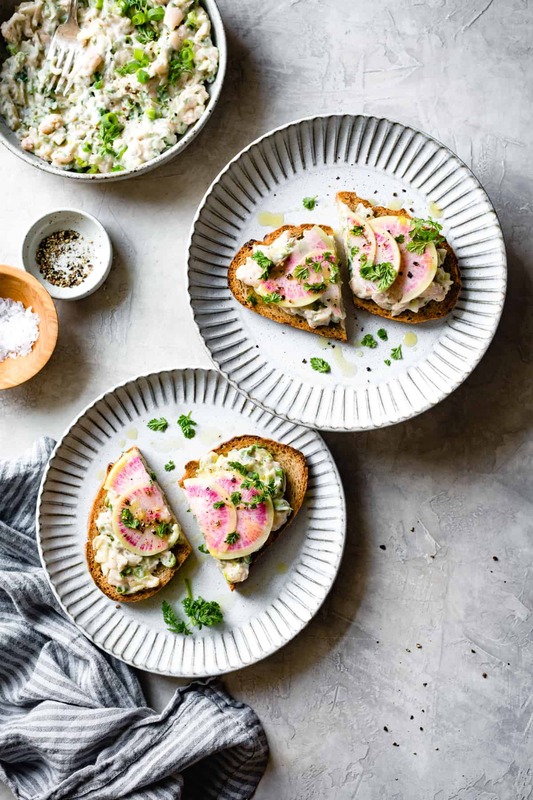 We’ve been loving these smashed white bean salad tartines from the Mains – Simplest Fare chapter. 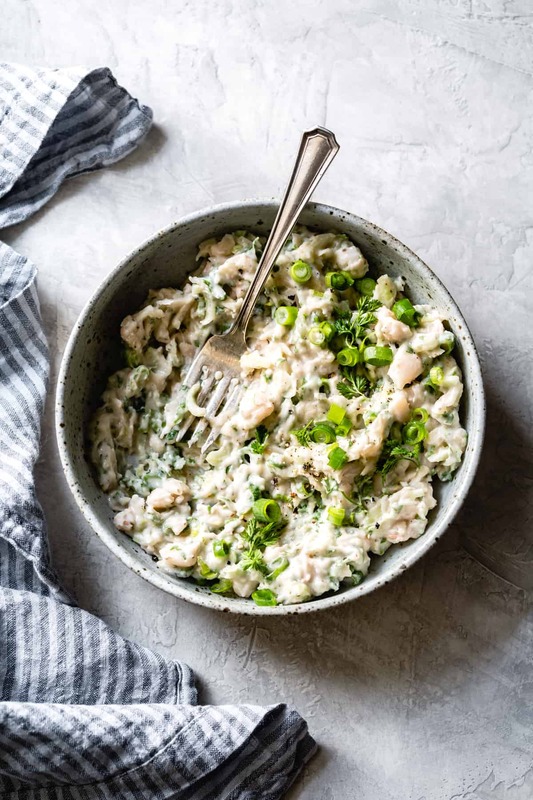 Creamy white beans need only the tiniest amount of mayonnaise and a light mashing to develop a luscious texture. One day I was out of white beans and tried it with chickpeas instead, and it wasn’t nearly as creamy. Sonja and Alex stick to the classic flavors of lemon, celery, garlic, scallion, and a little pepper. They include the header suggestion of adding fresh herbs if you’ve got ’em, or serving the white bean mash over salad greens. I found some pretty chervil at our co-op – which tastes like mild parsley crossed with fresh fennel – and I replaced the fresh celery with fennel to play up the Italian vibe. 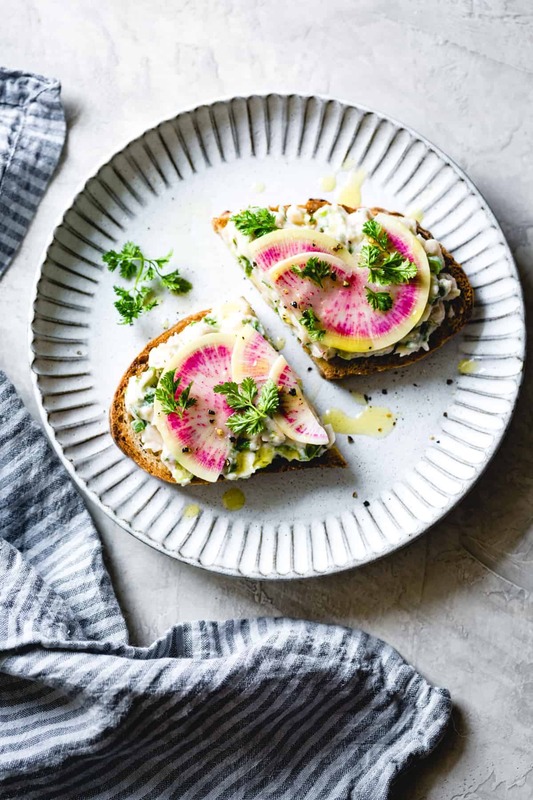 Pressed into slices of toasted bread and topped with thinly sliced watermelon radish and a drizzle of olive oil, this white bean salad makes a speedy lunch. Here I used the life-changing gluten-free sourdough boule from Arise Bakery, which you can order and have shipped anywhere in the US. The original recipe sandwiches the white bean salad between halved croissant layers, which looks like it would be absolutely divine. 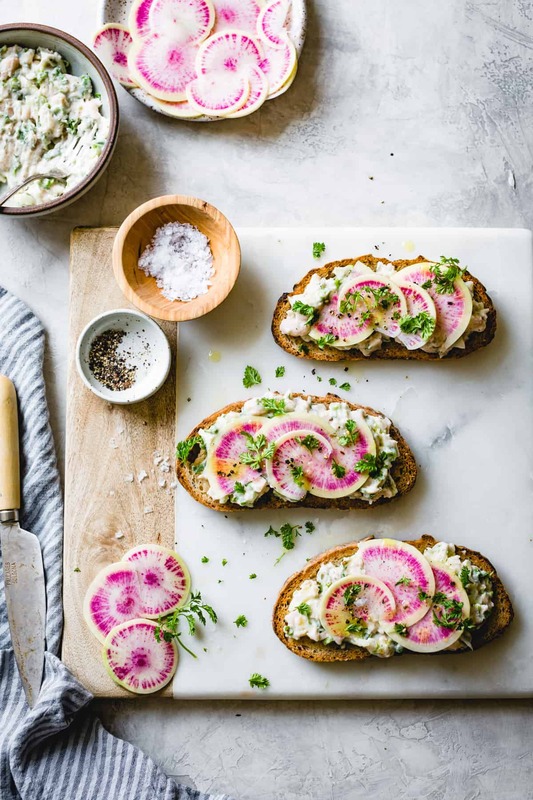 If you assemble these tartines on small slices of toasted baguette (also available from Arise Bakery and insanely amazing) you have yourself a fancy dinner party starter. Or serve a scoop atop a green salad, or spread it on crackers for a quick snack. Use vegan mayo and gluten-free bread if your dietary preference would prefer. However you prepare it, you’re sure to revel in a pretty simple meal that’s good for you, too. Lightly adapted from Pretty Simple Cooking by Sonja and Alex Overhiser. 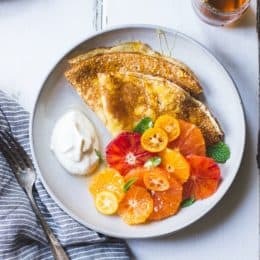 I like to toast my bread with butter in a cast iron skillet set over medium-low heat; the butter solids and bread caramelize in the pan and it becomes extra crispy. Here I used gluten-free boules from Arise Bakery, which can be mail-ordered anywhere in the US. The white bean salad also makes a delicious and simple dip for crackers. Roughly mash the beans in a medium bowl, leaving about a third of them whole. Stir in the mayonnaise, lemon juice, fennel, green onions, celery seed, garlic powder, smaller amount of salt, pepper, and the herbs. Taste, adding more of anything that you feel the salad needs. 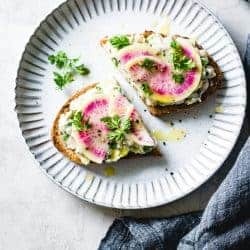 Spread the white bean salad on the toasted bread and top with radish, a drizzle of olive oil, a few pinches flaky salt, pepper, and herbs or greens, if using. Serve right away. I love this! 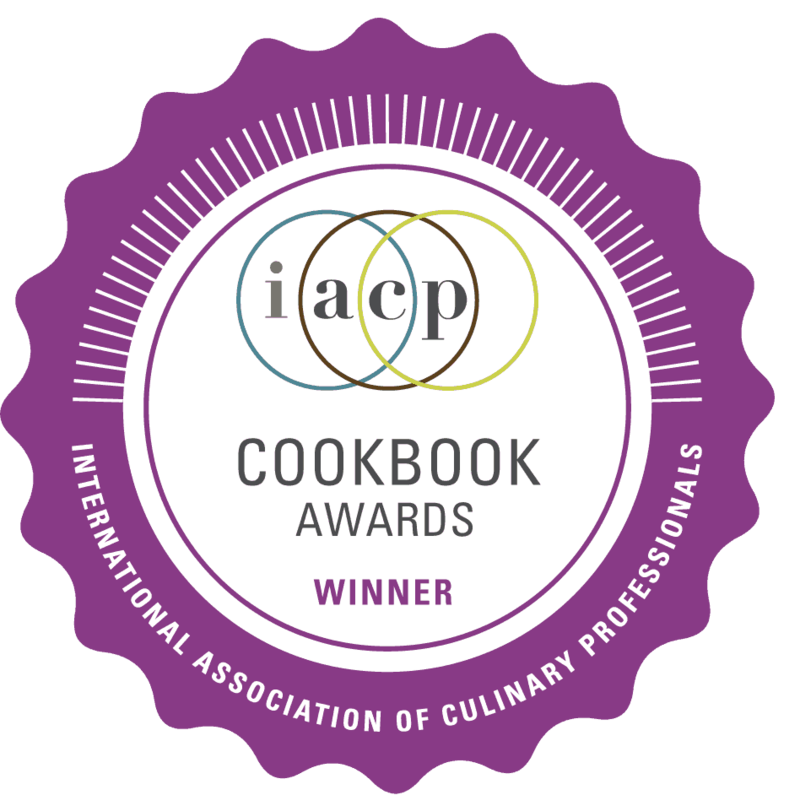 Lunch tomorrow – thank you! made this for lunch today and added slices of watermelon, radish, tomato and cucumbers. Also added a minced green chili, chopped onion and some tabasco to the white bean mash. Herbs i used were mint and dill. Yay! I’m so glad you liked them. Those additions sound divine! They are just so beautiful that I cannot eat them if I have chance to make this xD. Your photography is really inspiring with the great color combination! 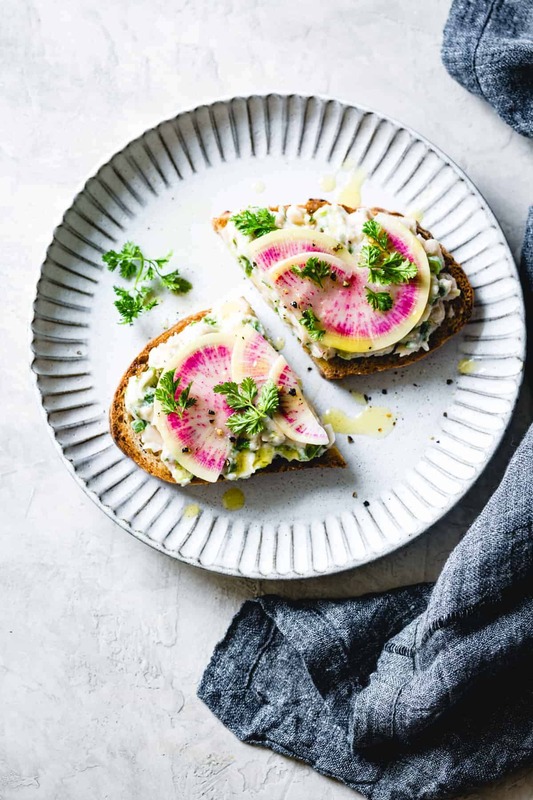 These are the prettiest tartines for spring, and the book sounds lovely! 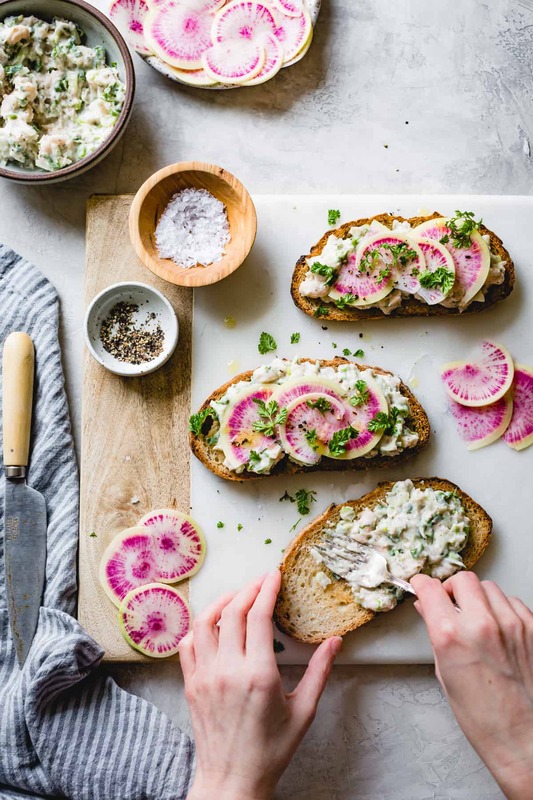 I love simple, clean and hearty small plates like these, especially how lovely you captured them Happy feasting. These were very good. My grocery store was out of watermelon radishes, so I used yellow heirloom tomato slices and that worked well for me. Thanks for a good recipe!